It’s the Holiday Season, and you have lots of parties on your agenda. You’ll need to bring a gift for each, but not sure what to bring. Here is a list of several fantastic choices – fun and unusual! Starting with the Whiskey Rocks – these cool (pun intended!) ice rocks keep your whiskey über cold, but without watering it down. Perfect for the amber loving consumer! The Bicycle Paper Clips are great for any active family. Handy, and useful – yet different! The Seven Year Pen is perfect for the writer, or the mom who needs her own, personal pen in her purse at all times! The extra large ink supply allows you to write 1.7 meters for 7 years. Pretty cool! These candles, are just to show you should give candles…. Stick with a set that isn’t over $200 like these are!!! The Red & White twine is perfect for the crafter! She will know JUST what to do with it, and will be thrilled to receive it! This Grocery List is perfect for a family’s fridge – check off the items as you use them. Tear the sheet off before you go to the market, and you know EXACTLY what you need! A Sushi Stapler is up next! Such a funny idea for the sushi-loving person in your life! Then we have the Diamond Magnets – great for the entertainer who loves all things sparkly! Notebooks are great for list-makers. And, they are absolutely beautiful! Some of my favorite places to purchase these gifts are Paper-Source. Be careful when you go in here…. It’s very dangerous for the paper-product-loving-crafter… I also love Francesca’s! They have beautiful jewelry and funky, quirky gifts that are sure to make you smile!! 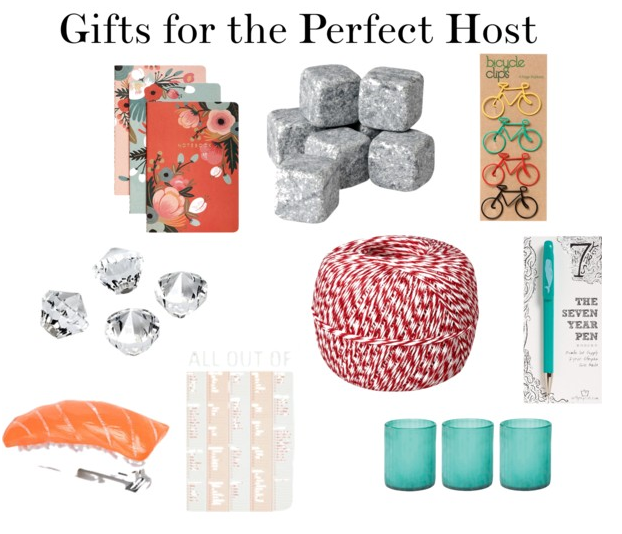 What are some other host/hostess ideas you have?? « 10 Tips for a Successful Craft Show!